How PiTape makes accurate diameter measurement so easy? The simplicity of use of a vernier periphery tape from PiTape conceals a wealth of sophistication. 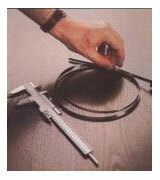 Using a precision vernier periphery tape manufactured by Pi Tape is very easy. It is a measuring tape that allows engineers of all disciplines to measure accurately the diameter of cylindrical and tubular objects directly without recourse to calipers or micrometers. To use it is simple. Wrap the tape firmly around the component, align the gauge member end of the tape with the vernier section on the other end, and immediately read off the diameter to the nearest 0.01mm / .001 inch. If you can read a vernier scale, you can use the Tape. to the right, the eleventh division on the vernier section is the only line that coincides with a line on the main gauge member. 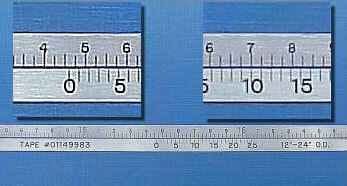 Since each of the 25 divisions represents 0.001 inch, then add 11 x 0.001 inch.